A Guide for Postdoctoral Fellows, the handbook for UBC PDFs, provides basic information and advice for prospective and current PDFs. It should facilitate your transition to UBC, and help to ensure that you have a satisfying and rewarding experience. Much of the information in this handbook is from the Faculty Relations website and in the Postdoctoral Fellows Office (PDFO) website. Please check these websites for more detailed information and to check for current language and developments. UBC operates according to policies, practices and procedures that may change from time to time. Contained herein are policies and resources pertinent to PDFs. PDFs may also be subject to additional policies that are specific to their departments or funding agencies. The official University of British Columbia Postdoctoral Policy, contained in Policy #61, can be found within the list of policies on the University Counsel website. Please ensure that you complete a Postdoc profile to describe your research project and expertise.Various offices and external entities may use the expertise search to identify experts at UBC, for example - media inquiries, research collaborators, prospective employers, government offices or other similar stakeholders. We strongly believe that these Postdoctoral profiles will provide numerous benefits to all of our UBC Postdoctoral Fellows. Additionally, your profile will appear in an internal Postdoc directory. Postdoctoral Fellows may be eligible for health benefits, which include BC Medical Services Plan, Extended Health, Dental and the Employee and Family Assistance Program. If you have any questions about your benefits eligibility or your enrollment, please contact your department administrator. Information about Benefits, including eligibility and coverage, is available on the UBC Human Resources website. Housing & Relocation Services helps with the smooth transition of new faculty, postdocs, staff and their families who are relocating to UBC. The office is an excellent first point of contact for those moving or who have recently moved, providing resources, support and events to help situate you in your new surroundings. Please contact the Housing & Relocation Services office for assistance with your relocation. The Postdoctoral Fellows Office offers free professional development events that are available to all UBC-appointed Postdoctoral Fellows. Any questions about PDFO events can be directed to postdoctoral.fellows@ubc.ca. Free, high-quality digital tutorials and courses through LyndaCampus. Please contact lynda.support@ubc.ca for information about LyndaCampus. Individual coaching through the Coaching @ UBC Program. Please contact coaching@hr.ubc.ca for information about the Coaching @ UBC Program. Visit UBC’s page at www.facultydiversity.org/institutions/ubc. Click “Activate my Membership”. Please note you will need an email address ending in “ubc.ca”. You should then be able to sign-in anytime to access the programs. Postdoctoral Fellows at UBC fall under UBC Policy #61, Postdoctoral Fellows. The official University of British Columbia Postdoctoral Policy can be found on the Office of the University Counsel website. Information about recruiting Postdoctoral Fellows can be found on the Faculty Relations website. Each department/unit is responsible for covering the cost of benefits for eligible Postdoctoral Fellows. Generally, benefits are paid out of the Supervisor/PI's project grant. The Benefits Cost Calculator provided by Payroll can assist you in estimating the cost of a Postdoctoral Fellow's benefits and statutory deductions. Detailed information about benefits for eligible Postdoctoral Fellows can be found on the Faculty Relations website. Detailed information about the immigration process for foreign Postdoctoral Fellows is available on the Faculty Relations website. All Postdoctoral Fellows must hold a formal appointment at UBC. The appointment process is followed regardless of funding source. Initial PDF appointments are typically made one year at a time, and are renewable up to 3 years (appointments may be renewable up to 5 years in total with the Dean’s written approval). Appointments are done at the departmental level, and information about the appointment process and requirements is available on the Faculty Relations website. In addition to the offer letter required by Faculty Relations, the PDFO requests that all units provide each incoming postdoc with a copy of the Welcome Letter provided by the PDFO. 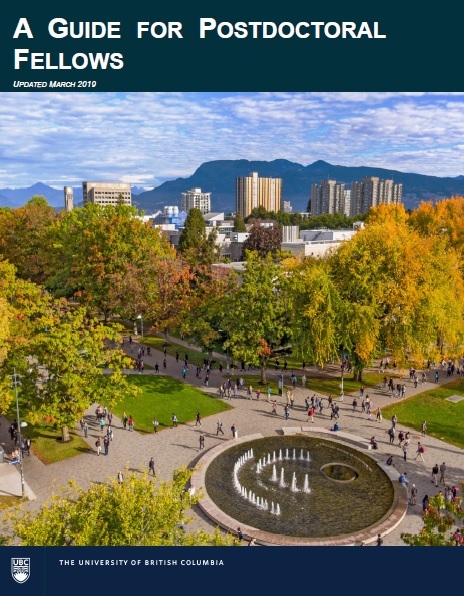 This Welcome Letter includes important information about Benefits, Housing and Relocation, Faculty Relations, and Orientation for new postdocs, as well as information about the PDFO and the UBC Postdoctoral Association. Please contact the PDFO with any questions about the Welcome Letter. The PDFO and Faculty Relations offer a joint annual workshop for Administrators. The workshop will cover a variety of topics related to postdocs which will include: the appointment process, benefits, immigration, onboarding and resources. The next UBC Administrators Workshop will be held in summer 2018. UBC’s official process for resolution of disagreements is found in Policy #61. Open and frequent communication between you and your supervising faculty member is the best way to avoid conflict. To resolve a disagreement between you and your supervising faculty member is to recognize it when it first arises, and collaborate immediately on finding a solution. If unresolved, disagreements should be brought to the attention of the head of your academic unit. The Faculty PDF Coordinator or the PDF may refer an issue to either the Associate Dean for PDFs in the Faculty of Graduate and Postdoctoral Studies at UBC Vancouver or the Dean, College of Graduate Studies at UBC Okanagan, whose decision on an issue will be final. For assistance with the appointment process, please contact Faculty Relations. For assistance with Benefits, please contact Human Resources. For assistance with Payroll, please contact the appropriate Faculty Payroll Representative. For assistance with immigration-related issues, please contact Housing and Relocation Services. For assistance with your particular appointment, please contact your department administrator. For information about the UBC Postdoctoral Association, please contact the UBC PDA. For all other enquiries, please contact us at postdoctoral.fellows@ubc.ca. Search Summary Resources for Postdocs, including a Guide for Postdoctoral Fellows, the handbook for UBC PDFs, provides basic information and advice for prospective and current PDFs. It should facilitate your transition to UBC, and help to ensure that you have a satisfying and rewarding experience.